Paula McCafferty is team leader at Antonine House in Glasgow. The home offers 24-hour care for people who are frail, at the end of life and those who have specific care needs. I support the management team to ensure that the standard of care is always impeccable and that care staff have the most extensive and up-to-date training. I am also a nurse and work closely with the residents and their families to provide support and reassurance. I am also the medication champion in Antonine House, carrying out audits and training, assisting other members of staff with any medication training and competencies. I was familiar with caring for older people as my mother was a care assistant. I used to love watching her make somebody's day better by doing simple tasks, and I always knew I wanted to do the same from a young age. I started my training at the University of the West of Scotland in 2008 and qualified in 2011. During my training, I would often be placed in Lanarkshire hospitals or health centres and I realised I wanted to work with older people and in end of life care. I have also completed a Macmillan palliative care facilitator’s course to enable me to provide a high level of care. Making a difference to people’s lives no matter now small. I quite often look after people who were not coping at home, either alone or with a care package in place. After a few weeks of care and the reassurance that someone is always there to support them and their family, we usually find that the resident becomes more confident and has a better quality of life. Every day, I also enjoy learning something new from listening to the residents' personal life experiences. I love spending time with my friends and family. The closest people in my life understand that sometimes my job can be as challenging as it is rewarding, so they support me in all that I do. I also enjoy going on holiday when I can. My residents inspire me to go above and beyond. When I see a simple task bring so much joy to a person, I feel a sense of fulfilment which inspires me to be the best nurse I can. 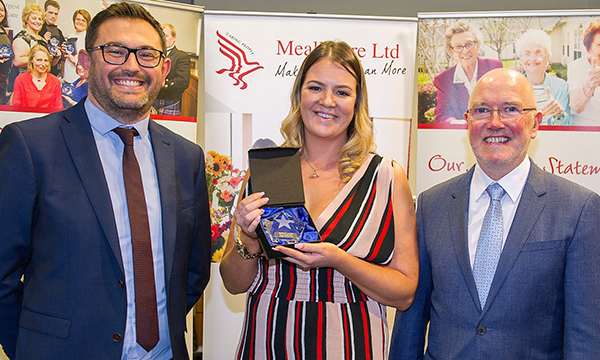 It was also motivating to receive the Nurse of the Year award at this year’s Meallmore Staff Awards (pictured). When working with older people what qualities do you think a nurse should possess? Patience, empathy and professionalism. We are the voices of those who can’t always be heard. We need good people skills, listening skills and the ability to communicate the wishes and concerns of those in our care, when they are sometime unable to do so themselves. Sometimes families can feel guilty or anxious when placing their loved one in a care home for the first time, and it can be difficult to watch them say their goodbyes as both parties can get upset. Over the years, I have learned that strong, effective and regular communication is vital in reducing any fears or anxieties. A quick call a few hours after the person has left, letting the person know how their loved one is, can make all the difference. Nursing is not a job, it’s a calling. Always strive to be the best, be polite and always put yourself in your patients’ shoes – sometimes even holding someone’s hand makes a difference. Sometimes a chat with the nurse is the only interaction a person will get, so don’t rush.